The Goldrush Popper is made of stainless steel welded construction. Standard features include a one-piece clean-in-place stainless steel or nickel plated all-steel kettle. The cabinet contains a heat lamp that keeps popcorn fresh and warm until serving. Rocker control switches at eye level provide easy operation with illuminated kettle heat switch. Other features include a heated corn deck, drop shelf, and tempered safety glass windows. The top is painted with Cretors special powder coating that resists scratching. 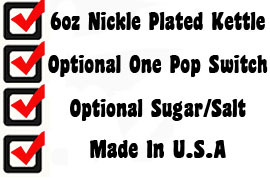 Options include a salt/sweet swtich, a One-Pop and One-Pop with counter. A matching two-wheel red cart is also available. The popper is UL and UL Sanitation approved. Designed for use with 6 oz. portion packs.